You can vote from among a fresh batch of 25 new ideas. Chicago's 88-year-old Union Station is not so much a destination as a place that people pass through on their way to somewhere else. Few people go there to shop, or to grab lunch from neighborhood offices, or even to linger for a drink ahead of an Amtrak trip. The iconic building west of the Loop on the Chicago River could play all of these roles, as Washington's Union Station and Philadelphia's 30th Street Station now do. But currently, with 120,000 commuters and long-distance travelers elbowing through every day, the station offers little more than a few fast food options and convenience stores. For a city that grew up as a railroad hub (OK, for livestock more than train-travel enthusiasts), you'd think Chicago could do better. The region's Metropolitan Planning Council is trying to jumpstart a broad conversation about how to change all this. For now, though, they're starting with some small ideas that seem manageable but provocative. 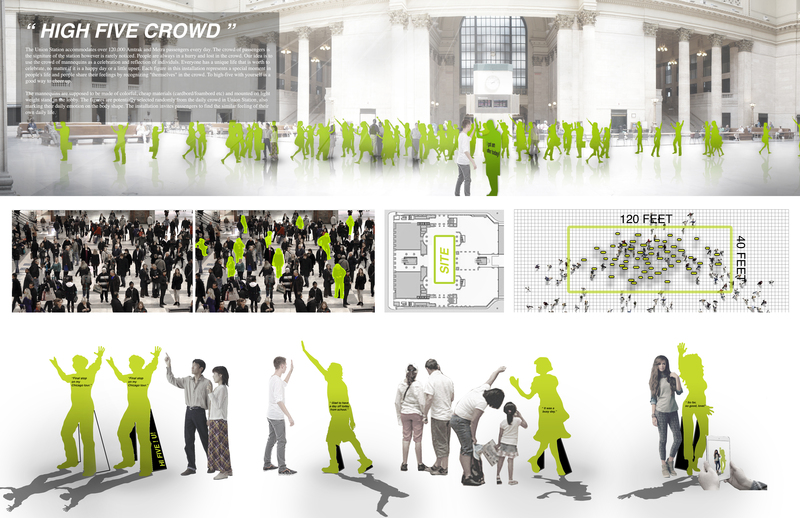 To that end, the planning council has been soliciting designs to "activate" a few corners of Union Station, with anything from temporary street furniture to wild art installations. The open call ended on Thursday, and now the public has until July 31 to vote for the best concepts among 25 proposals. A panel of judges will include the public feedback in selecting two winners set to receive $5,000 each to build out their proposal in the station for 10 days starting in late August. You can peruse all of the ideas here, but we've also pulled out a few of our favorites (the below links will all take you to a PDF). Among several other things, from Jessica Fong & Laurel Campbell Howard. A more sculptural take on the same idea, from Ann Lui and Craig Reschke. The figures mimic a range of emotions, from elated to exhausted, by Shuang Jiang and Zhexiong Chai. This installation would actually roll around the Great Hall, from WHo Design Lab-- Jamel Williams, Jose Hernandez, Jared Culp. That's also a public art project, from Daniel Robinson. This one is pretty self-explanatory, via Nicholas Moorhouse and Holden Scully. Strangers would interact by tying ribbons (one color for commuters, another for visitors) on a tree, by Holden Cavanaugh Scully.